It’s arguably a dubious distinction, and entirely academic, but it’s a record nonetheless. For years, systems like IDE64 (and uIEC/IDE) have been able to marry large hard drives up to the Commodore platform. While I don’t personally know of such an installation, I would be surprised if someone doesn’t have a 500GB or 1TB PATA HDD attached to their C64. This ignores the real question: Would all of the Commodore 8-bit software ever produced fill even a fraction of that space? I highly doubt it, though there is more than one would think. GameBase64 v7 was 5.3GB compressed, so I think one could fill 10-20GB with every version of every software package written for any Commodore 8-bit machine (PET to C65). In any case, nearly every contemporary storage solution for the Commodore line can handle that amount. Even the lowly Secure Digital drives, like uIEC/SD, support 32GB SDHC cards. Cautious buyers will often inquire about the maximum drive size support for uIEC/SD. 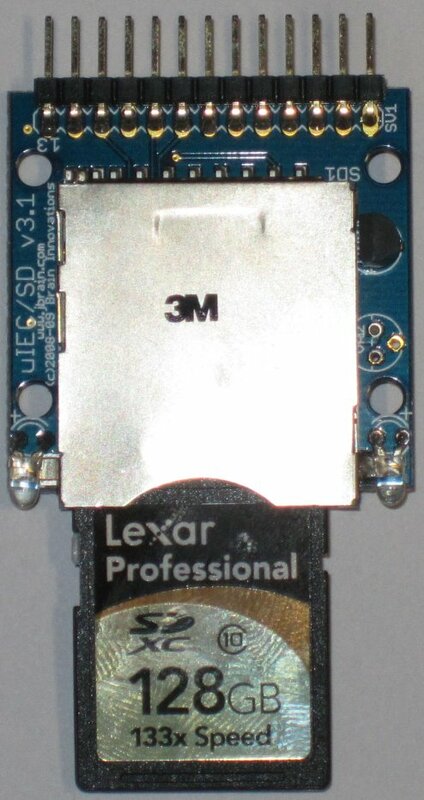 I often tell them that the uIEC/SD will support SDHC cards up to 32GB in size. 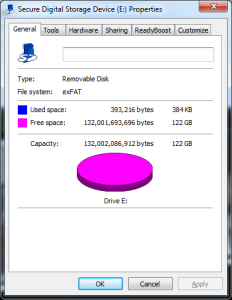 That limit is a specification maximum, listed in the SDHC documents as the absolute maximum size allowed. That satisfies most people, but I do get followups on occasion about support for larger media. Until recently, there were no larger media options, but 2009 saw the introduction of SDXC, which eliminated the 32GB limit. The SDXC cards were intended for cameras and camcorders, which had moved away from tape media to flash media like SD and demanded ever more storage space. As prospective buyers became more aware of SDXC, I received inquiries on whether uIEC/SD supported these larger media options. With no card to test, I countered that 32GB should satisfy any need, and one could always buy 2 of them as insurance against lack of space. The topic of SDXC support came up recently, and I decided to update my knowledge. I knew about the format, and I knew that SDXC cards came factory formatted in Microsoft’s proprietary exFAT format. But, research uncovered many people who simply reformatted their cards to FAT32 and happily used them without any issues. I had previously assumed the SDXC protocol differed in significant ways from the SDHC protocol. So, I decided to pick up a card and try it out. The prudent choice would have been to snag a less expensive 64GB card, but I decided to go all out and pick up a Lexar Professional 128GB SDXC (the largest I could find). At $160.00, it’s not a cheap chip of plastic, but I decided I could always use it as a second HDD in my laptop. Upon delivery, I immediately imaged the entire raw card using Roadkil’s Disk Image utility. 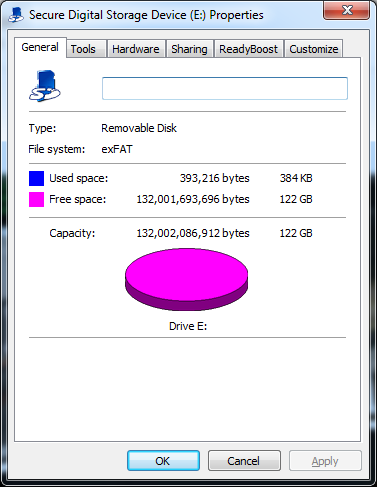 After 3 hours, a 128GB image was available, which I immediately compressed to 4MB and archived. It’s unclear if dumping the expanded image back to the card will put the data back in the original location in the FLASH memory, but it seemed prudent to save off the image in case it was later needed. I then used a third party utility to format the entire card in FAT32 with 32768 byte sectors. I suspect contemporary operating systems will allow this as well, but I was in a hurry and the utility was handy. I created a small BASIC program and saved it to disk. The activity light came on and lingered, forcing me to wonder if the unit had locked up with the light on. However, after 2:21 (2 minutes and 21 seconds), the light went off and the BASIC prompt returned. A disk directory showed the new file, and loading it was very fast. Subsequent saves were very quick, even after resetting the machine, power cycling, and re-installing the card. Files were correctly saved, and a nominal test of directory commands and disk operations showed nothing extraordinary. Honestly, the entire event was anticlimactic. Ignoring the fact that there can’t possibly by 128gB of Commodore 8-bit files, I think it’s just too large a card for storage. I’ll continue to recommend 8GB cards: they deliver the best price per GB, one needs only a few to hold everything, and files can be easily segrated by platform among a few cards. Still, if you feel the need for maximum drive size, rest assured that any product offering based on a recent build of Ingo Korb’s sd2iec appears to support FAT32 formatted SDXC cards. However, I can say with certainty that the native SDXC exFAT disk format will never be supported in sd2iec, because it requires a license from Microsoft to use. Such an implementation would never be allowed to use the GPLv2 license, which sd2iec utilizes.